"I can understand in the confines of a footy game you push that edge and sometimes you make a decision that is over the line. "Pretty much every step I was taking I was in pain, so jogging was painful [and] I couldn't reach top speed," Martin said. Frustrated but forced to battle on, Martin did the best he could without being anywhere near the player he wanted to be. It made his effort to finish third in the club best and fairest admirable (after sharing first place a season earlier), but Martin didn't see the podium finish in that light. However, that experience has made the 199cm, mobile big man desperate to make amends next season. Although still in the rehab group, he is enjoying a week down at Launceston with his teammates and, in particular, being able to once again do leg weights and speed work at training. "It is like I am a first-year [player] in that way so it is really exciting. [I'm] largely pain free [and] able to do everything, which is the important thing whereas I was really limited last year," Martin said. Having turned 30 a little under a month ago, he is well aware he is the only player in that age bracket on the Lions list. In Martin's nine seasons playing AFL football, he has never had a winning season, having celebrated victory in just 27 of his 114 games. He admits early on in his career, during his time with Melbourne particularly, he wasn't as invested in the team's fortunes as he should have been. However, that has now changed and he is determined to take ownership over the team's fortunes. 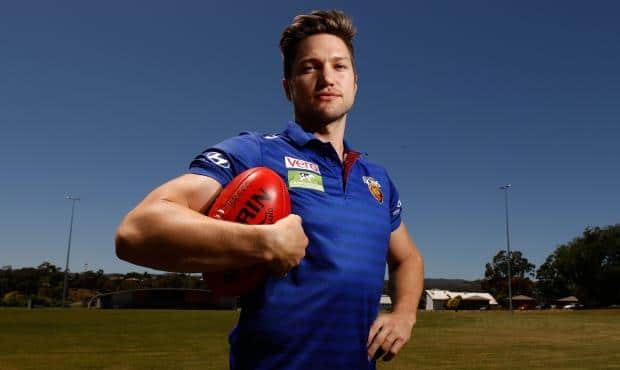 As does Martin's knee, which is a bonus for the Lions, who need him to carry a heavy load as youngsters Archie Smith and Oscar McInerney develop as ruckmen.